This Applicator Gun enables easy and precise application of the Maxforce® White IC Cockroach Gel. The Maxforce® Applicator Guns ratchet system ensures that with each squeeze of the trigger an exact amount of product is dispensed every time, guaranteeing easy and precise baiting. The Maxforce® Applicator Gun is especially suited for getting into hard-to-reach places in kitchens and other target areas where cockroaches may be harbouring. For use with 30g tubes of Maxforce® White IC Cockroach Killer Gel. Gel must be purchased separately. 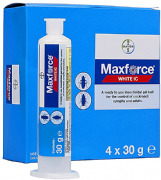 Apply one spot of Maxforce® White IC Cockroach Killer Gel at 1 meter intervals, depending upon the severity of the infestation. A 30g tube will provide coverage for up to 300 meters.